They’re Ugly, and um, oh yeah…maybe dangerous. I’ve never understood why any human being over 8 years old would want to wear these things, though I’ve been willing to concede that if (if!) they have some orthopedic value, then I’ll make an exception for, say, nurses and people with back problems. 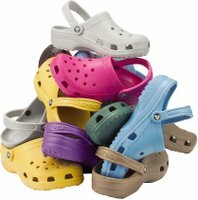 An increasing number of hospitals and health centres are moving toward banning Crocs and Crocs knock-offs from their facilities for fear the shoes have endangered both patients and staff. The main offenders appear to be the popular Beach and Cayman models, which have holes on top, side vents and a back strap rather than a closed heel. They allegedly have been responsible for infection control hazards because bodily fluids such as blood have spilled into the holes. Staff have reportedly twisted ankles because of the open back. And staff reaction times are said to be compromised because it’s suspected that clogs are more difficult to run in than traditional hospital footwear. The most heinous charge against Crocs and similar shoes is that they act as “isolators,” enabling enough static electricity to be generated to knock out medical equipment — including respirators in maternity wards. The manufacturers, naturally, deny the static electricity problem. No word yet on whether they’ll plead guilty to the charge of ugly.